You know what? Waffles are wonderful. It sounds like it should be a children’s book (It’s not, I googled it). If it were, it would be an artfully woven story set in the magical land of Breakfastia, which is inhabited – of course – by a satisfied and loving community of early-morning delicacies. It would be a land where Ollie Omelett would reside happily between Betty Bacon and Harry Hashbrown. Where Patti Pancake could play peacefully with Sally Strawberry, and even Polly Porrige and Greta Granola would be welcomed into this complete and balanced society. This utopia of personified provisions would be presided over by king Wally Waffle, whose time would be devoured by daily challenges. Perhaps Molly Milk has gone missing, and Wally, with the help of Molly’s concerned life-partner Cindy Cereal, must find her. Or maybe Wally and his sweet and loving wife, Sally Syrup, have to help resolve the sizzling competition between the aforementioned Betty and her British boyfriend, Randy Rasher. Or perhaps Wally is tasked with introducing his foreign cousins – the slender, seductive Swede, Peder Pannkakor, and the plump, luscious German, Adelbert Apfelpfannkuchen – to a wary and unadventurous domestic populace, who ultimately come to realize that every breakfast, no matter how much of a mouthful, can be savored in its own unique way. In each case, Wally Waffle emerges as the hero. Why? Because he’s the warm, savory, toothsome king of Breakfastia, who along with his wife, the sacchariferous Sally, will rule the land of breakfast forever more, and leave your tummy feeling happy ever after… or at least until you near the lunchtime domain of Sammy the Sandwich. Want to create your own King and Queen of Breakfastia? Here’s how to do it. Fold the dry ingredients together in a large bowl. Stir in the remaining ingredients and whisk the lumps out. Let the mixture sit for 20-30 minutes. 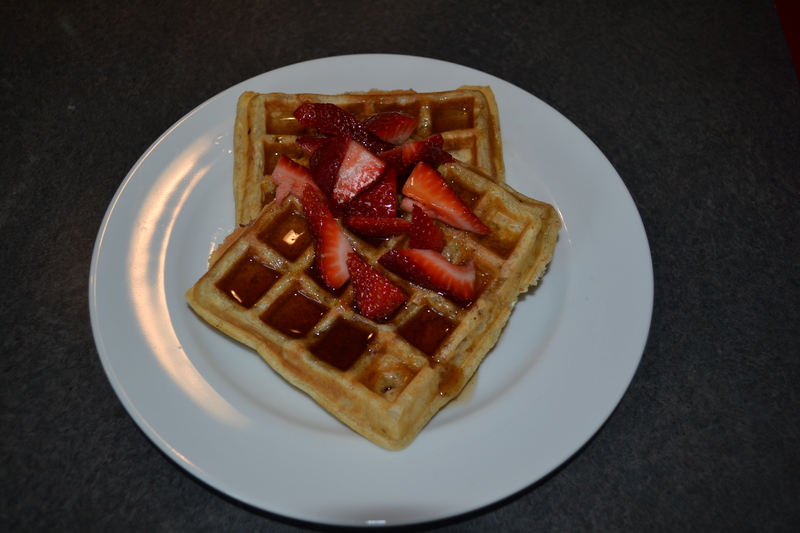 Preheat the waffle iron, and cook the mix according to the waffle iron instructions. Serve with syrup, sliced strawberries, or any other topping that you like! Bring the mixture to a low rolling boil over medium heat. Reduce heat to low, and simmer for 15 minutes. I have no space in my kitchen, but I am going to keep begging for a waffle maker. The SO gets a deep fryer, why can’t I have a waffle maker!? Keep pushing for the waffle maker. Hands down one of the best in the kitchen. Sounds like you need one, I think you need to push for it! Besides, a deep fryer is a luxury, a waffle maker is a necessity. The dish looks awesome, but mostly now all I can think about is living in Breakfastia. All my favorite friends are already there! For real. It would be a wonderful place to live!